Capablanca lost his World Championship title to Alekhine in an epic battle in Buenos Aires in 1927. It took Alekhine 34 games to reach the required six wins in a monumental upset. Thirty-one of those thirty-four opened with the Queen's Gambit Declined. 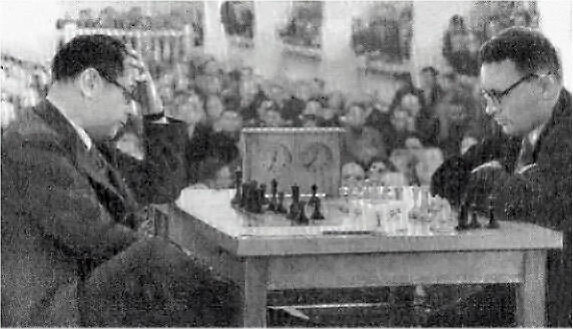 Capa vented his frustration by declaring the game of chess "dead" because the best ways of playing it had already been found and demonstrated during the match. Then he sailed for Europe where he played one tournament after another obviously trying to drum up some public support for the return match. In spite of declaring the game “dead” he had clearly decided he needed to shake things up, and it was a bit of a shock to his rivals when he began playing the Nimzo-Indian. What? The Nimzo? Capa had never played it when he was Champion, although he did have a few wins on the black side of the Queen's Indian Defense, including a crushing one over Alekhine himself in the opening round of the 1927 New York Tournament. The following game shows what Capablanca learned from the near disaster against Kmoch. The next game is known for its big Oops. Perhaps the most atrocious blunder in Capablanca's entire career. Still, it was his second Nimzo-Indian in Karlsbad 1929. It was perhaps a shot of confidence to the opening's creator since Aron Nimzowitsch would ultimately score the greatest victory of his career, taking clear first, just a half point ahead of Capablanca himself. It was a time of manly-man tournaments, and Nimzowitsch scored 15.0/21, to Capa's 14.5/21. That's right, it was a 22-player round-robin. Just for the record, here is the mammoth crosstable. Click on it to see the full thing. The next game, played in 1931, featured a Queen's Indian Defense, an opening that seemed to suit Capablanca better, judging from his results. In it, he found a great improvement against a trick that had been plaguing Black until then. Rather a poor effort by Capa, who missed a lot of tactics. I guess this is the real reason for his repeated failures on the black side of the Nimzo as age was catching up with him. One can throw in the more famous losses to Lilienthal, Hastings 1934-35 (remember the queen sac there?) and to Botvinnik in the AVRO tournament. Does it mean Capa made a wrong choice by abandoning his trusted QGD in favor of new ideas? Hard to tell, but the fact is, the following year, 1936, was arguably the most successful in Capa's post-Championship career. He notched two tournament wins shared with Botvinnik, in Moscow and, especially important, in Nottingham, along with a clear first in a smaller event in Margate. Throughout all this he never played the Nimzo, only QGD with some occasional Slavs. Go figure. He did however employ the Queen's Indian, which includes a famous win over Botvinnik in Moscow 1936, but that's another story. In the Kmoch game, played in 1928, Yermolinsky states that "My System" had not been written yet. My recollection was that "My System" was translated into English in 1927. Checking the Nimzovich article on wikipedia, which took a whopping thirty seconds or so, I found that "My System" was originally published in 1925. I really wish that "one of the best commentators of the game", as well as the rest of his titled kin would spend some time checking their facts. Could it be that during this time, the Nimzo-Indian was undergoing a lot of development and staying current on the latest developments was important?- in other words, may be not the best opening for Capablanca if he wasn't keen on a lot of away-from-tourney studying. Plus, he was suffering from high blood pressure and facing some of the best younger players of the time. I double-checked Alekhine's book about Nottingham 1936. Capablanca-Botvinnik at that event was a draw. Nice article by one of the best commentators of the game on one of the greatest players of all time. Playing through Capa's games is always a refreshing treat.